In automotive culture, excess garners attention. People love to compete for the highest peak horsepower, the lowest possible ride height or the most flamboyant widebody fenders. For Yokohama tuning shop, Advance, building a car that balances style, speed and practicality without being excessive makes the most sense. 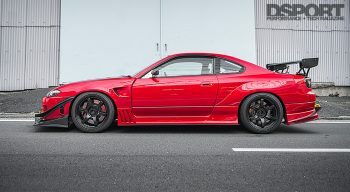 Advance’s Tasuku Yagihashi viewed the Nissan Silvia S15 as a prime example of a do-it-all machine. When he started his search for a car, Yagihashi knew he wanted a lightweight chassis with plenty of power. Most importantly, he wanted something exciting on track but also practical for commuting to and from work. To that end, he purchased an S15 Silvia, and built it into the all-purpose machine it is today. 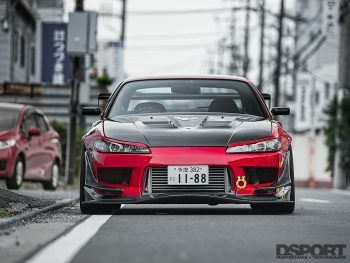 At first glance, the S15’s aftermarket bodywork catches the eye. 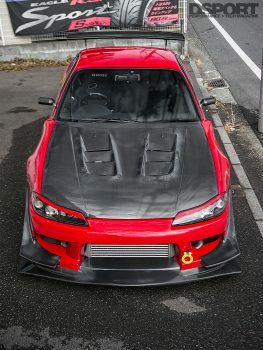 A full Garage Mak Type V aero kit enhances the Silvia’s body lines, subtle aggression. 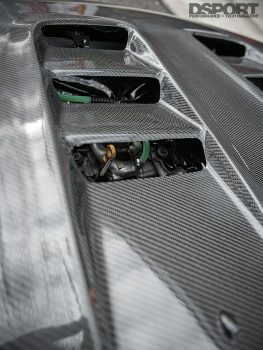 A carbon-fiber splitter and canards up front announce the car’s presence, as does the vented carbon fiber hood. 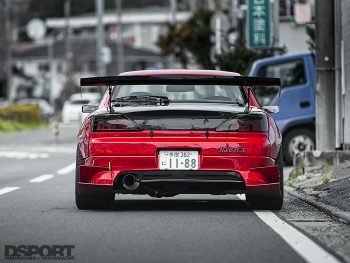 Look a little closer and you’ll see the wider fenders, full of vents and louvers, pushing the body past its original width and allowing a wider stance. At the rear, a carbon fiber trunk lid, tall wing and rear canards keep the tail end firmly planted to the ground at speed. Is all of this necessary for a streetcar? 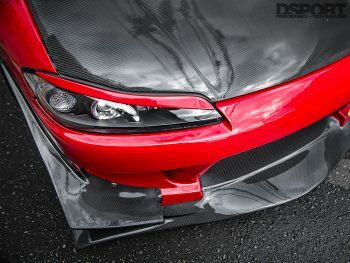 Since Yagihashi frequently brings the S15 to circuits throughout Japan, all of the aero serves a functional purpose. Altogether, the Garage Mak bodywork bears uncanny resemblance to Japanese Super GT touring cars, but this S15 is more than just a track toy for Yagihashi – it’s also his daily driver. 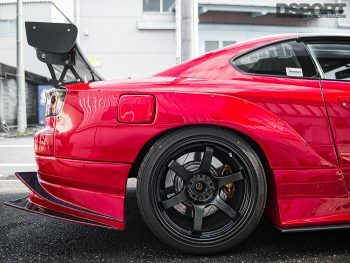 Weighing in at just 1,250 kg (2,755 lbs), Yagihashi’s S15 certainly fills the lightweight requirement. Given the amount of time he spends at the track, chassis and handling were two of his top priorities. HKS Hipermax IV coilovers provide damping and ride height adjustment, allowing him to fine tune the suspension for track or street use. 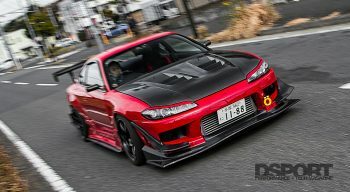 Yagihashi’s S15 rides on a set of 18-inch Gram Lights 57DRs, finished in gray which accentuates the carbon-fiber bodywork. Goodyear RS Sport tires wrap around the wheels to put the power onto the road, measuring 255/35R18 in the front and 265/35R18 in the rear. The front end slows down using a set of Brembo Monoblock calipers and 355mm slotted rotors, while the rear brakes borrow calipers from the R34 GT-R; both front and rear utilize a set of Brembo rotors and Endless MX72 brake pads for improved stopping power with minimal brake fade. Serving double duty as Yagihashi’s daily driver and track toy, the Advance S15 interior sports all the creature comforts to make the car enjoyable on the street, with additions to keep him focused at the track. 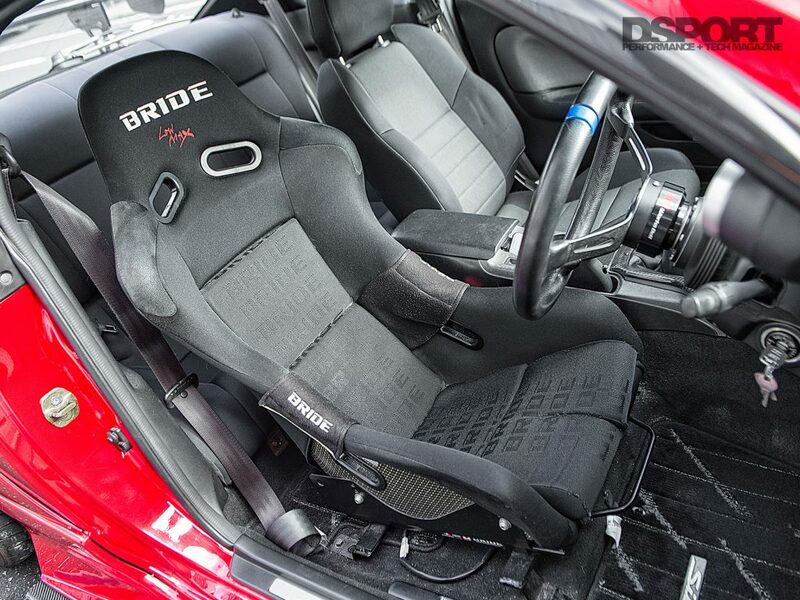 The car employs a BRIDE Vios III seat on the driver’s side, holding him in place in the turns and shedding curb weight. 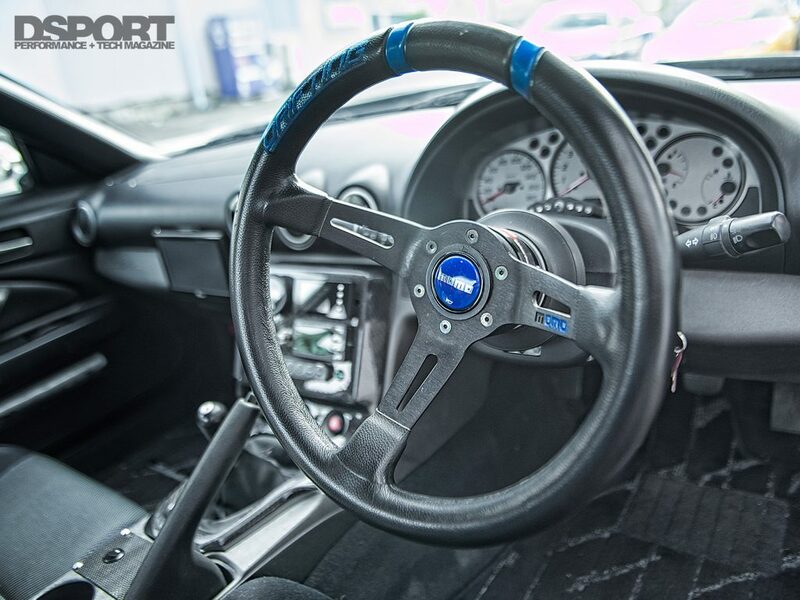 Taking inspiration from racecars, a dished Momo steering wheel attaches to the hub through a Works Bell quick release. 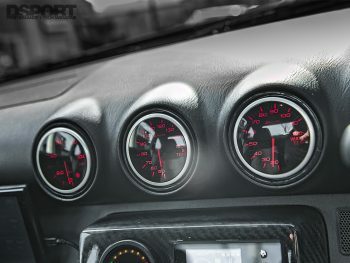 The standard instrument cluster remains unchanged, but Yagihashi has added an array of gauges to keep him in tune with his car. 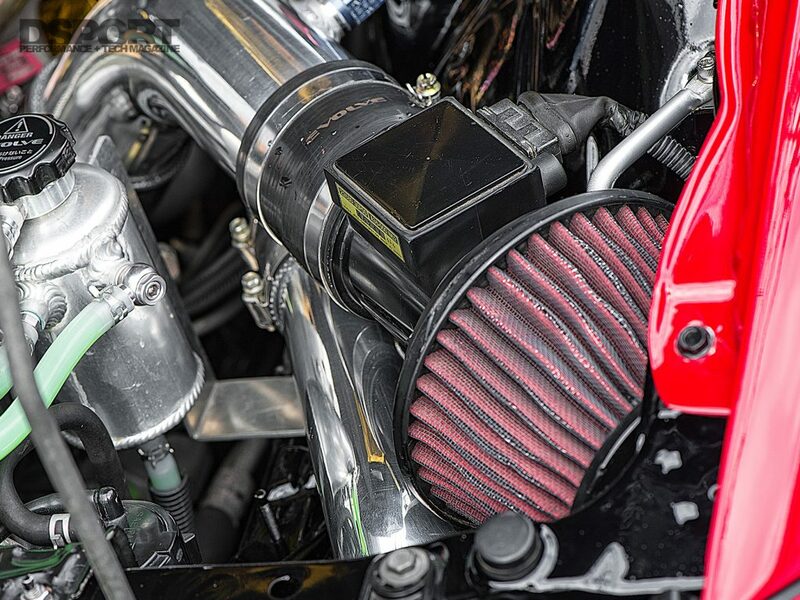 Boost, wideband air/fuel, oil pressure and temperature gauges monitor engine vitals to ensure the car runs as it should, and an HKS Circuit Attack Counter records and displays lap times and track data in real time. 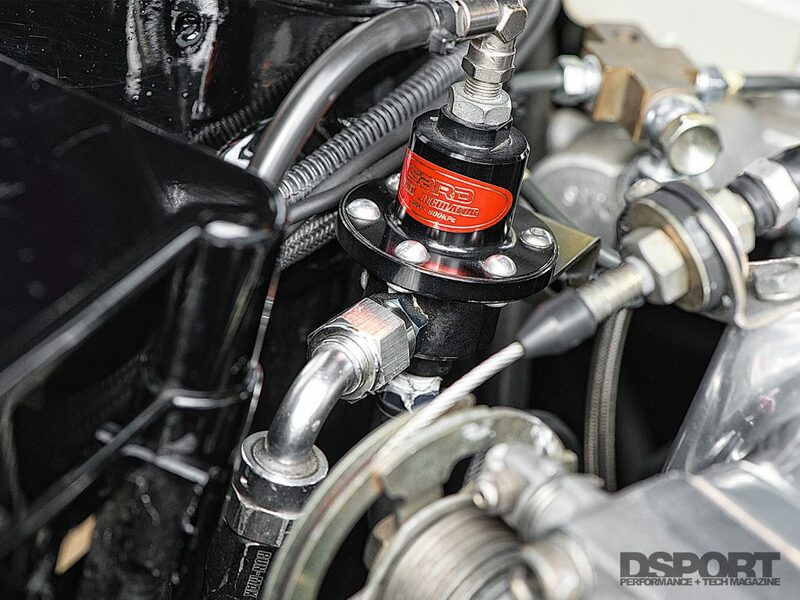 The stout nature of the S15’s SR20DET allowed Yagihashi to keep the stock bottom end for his intended output target, but his future plans to increase displacement will open up the perfect opportunity to fortify the rotating assembly. All-out power numbers tend to wreak havoc on drivability and reliability, so Yagihashi opted for a streetable engine build which could still usable power and torque. 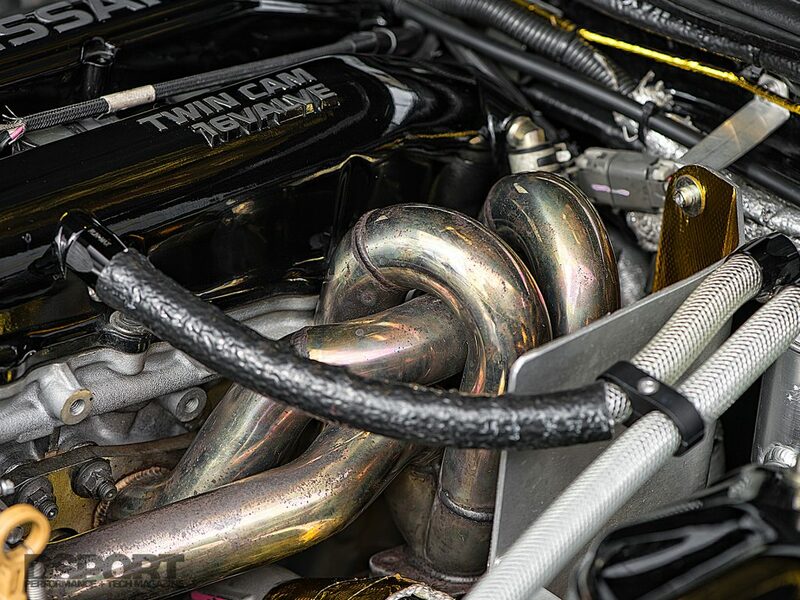 The SR20DET under the hood relies on a YP Turbine kit for boost pressure. 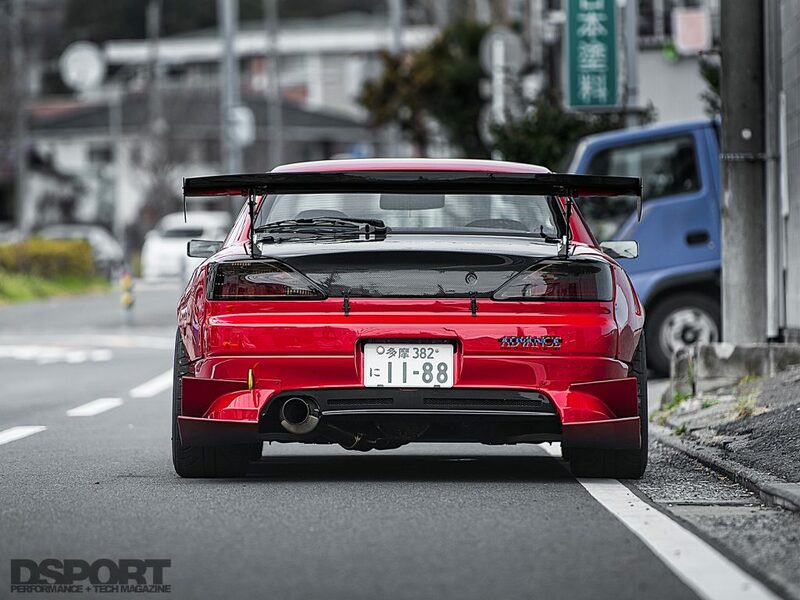 It was product of a collaboration between Japanese tuning companies Yashio Factory and GP Sports. 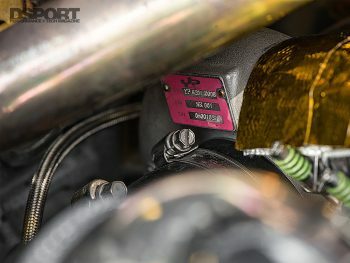 The design theory of the YP Turbine was to create a responsive turbocharger with enough peak power for time attack or drifting, and its output potential aligned with Yagihashi’s goal. An HKS Wastegate Actuator and an EVC6-IR Boost Controller regulate boost pressure with peak boost coming in at 1.5 kg/cm2. A custom fabricated HPI 4-to-1 exhaust manifold sends exhaust through the turbine, exiting through a GP Sports Exas F1 exhaust system. On the top end, HKS Stage 1 cams bump power output without compromising low and mid-range drivability. 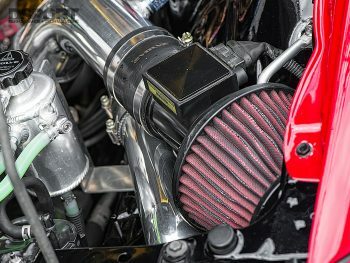 At the front, a GReddy oil cooler, HPI Hi-Spec intercooler and triple-pass radiator keep fluid and charge air temperatures in check, on the racetrack or in bumper-to-bumper in traffic. 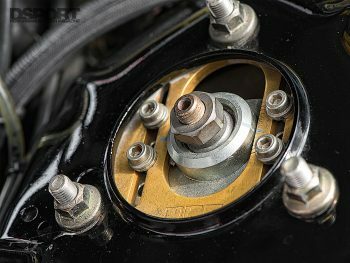 This is an important element of the build, as an overheating car can quickly ruin a day at the track or prolong the morning commute. For engine management, an HKS F-CON V Pro controls a set of SARD 850cc/min injectors, which receive 100-octane fuel from a NISMO fuel pump. 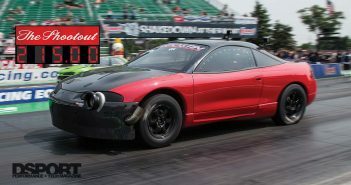 Tested on a Dynapack dynamometer, the S15 put down 409.12hp at 6,900 RPM and 348.63lb- of torque at 5,500 RPM. 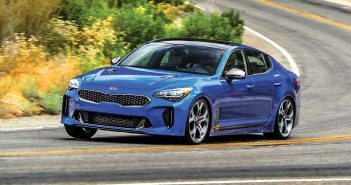 While it’s far from the most powerful car on the road, it has enough power to put in good lap times at the track. The S15 is close to Yagihashi’s vision, but like any project, it isn’t done yet. 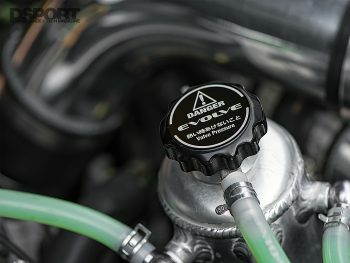 He plans to increase displacement to 2.2 liters for improved response and higher output. He also plans to strengthen the internals of the factory six-speed transmission to keep up with the added output. From there the car can continue its daily driving duties while running quicker lap times around the circuits of Japan.